I usually take great pride in being able to analyze each film I watch, finding purpose and meaning in even the most ambiguous endings. While there are certain themes that were clear to me after watching The Red Turtle, aspects of the narrative were indecipherable to me. What’s more, I felt little desire to dissect the narrative. Despite having a number of confounding fantastical sequences in an otherwise realistic tale of survival, I was content to let the feelings from Michael Dudok De Wit’s images wash over me like the waves that kept him confined to his deserted island. Although one could speculate on deeper meanings and practical explanation, I found the beauty of The Red Turtle to lie in the emotions evoked by the atmosphere of the imagery, even when the film seems makes little realistic sense. The focus must be on the images, as The Red Turtle is free of dialogue. This is an easy task for the basic premise of the film, which follows the survival tale of a solitary man shipwrecked at sea and ultimately stranded on a remote island. Alone on the island, there is nobody that he would be able to talk to, even if Dudok de Wit had not decided to remove dialogue from the narrative, until an element of fantasy intrudes. Much of this first section deals with the exasperation and desperation of this stranded man as he searches his surroundings for an escape. After a few close calls in the perilous terrain of the beautiful island, he begins making plans for an escape, despite an unseen force intent on keeping him stranded. Shortly after exploring the island inhabited by only turtles, crabs, and birds, our solitary survivor works to construct a raft made out of the island’s resources. When the first raft is inexplicably destroyed not long after leaving shore, the man attempts to build one even larger and sturdier than the first. This one is also destroyed with ease by an unseen force below the surface of the water, which mysteriously disappears each time the man searches for the culprit. This continues until we finally discover the cause is the title character, a large sea turtle with a bright red shell. Although the turtle shows no malice towards the man and simply seems to want him to remain stranded, his frustration with the creature causes him to lash out. After beating the turtle with the same materials used to make his escape rafts, the man overturns the massive turtle and leaves it for dead. This impulsive outburst leads to regret, but not before the damage has been done. This is also where the film diverges from realism with a sequence of fantasy, to be read as a mystical occurrence or simply an imagined delusion from a man whose mind has broken in the trauma of solitude. There is no absolute clarity as to which is the truth, and the film seems to work better without the practicality of these answers. Instead of knowing for certain what is real, we are left with the emotions of the encounter to navigate the remainder of the man’s journey on the island. The choice to make The Red Turtle dialogue free may have been a creative one, but it also speaks to the universal nature of the narrative as well as the production of the film itself. 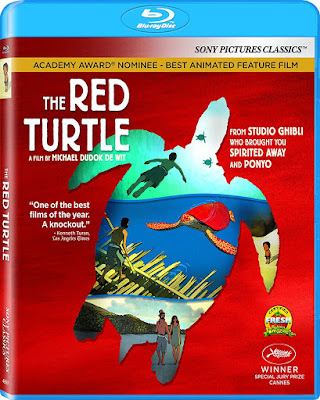 Although directed by Dudok de Wit, who comes from the Netherlands, The Red Turtle was produced by the acclaimed Japanese animation company, Studio Ghibli. This pairing may seem unlikely as well as being unprecedented, but works magnificently well. 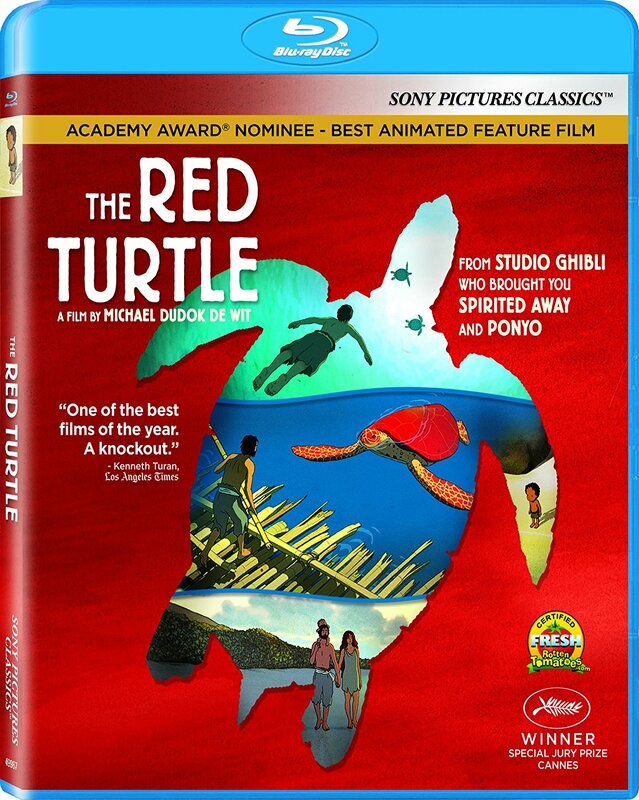 The Blu-ray release of The Red Turtle comes with no alternate ways of viewing the film (DVD, digital copy), though that does not take away from the impressive high definition presentation of the beautiful hand-drawn animation. The disc also comes with a handful of special features, all of which are detailed and informative. The highlight of these is a director’s commentary track, though there is just as much insight in an hour-long featurette about the film. Both have Dudok de Wit explaining the themes as well as the technical process of the filmmaking, though there is an additional 17-minute featurette with the filmmaker actually demonstrating some of the key animation techniques used to bring the story to life. The final extra is a 20-minute Q&A from the AFI Film Festival, in which the filmmaker discusses the process further, including the decision to collaborate with Studio Ghibli.